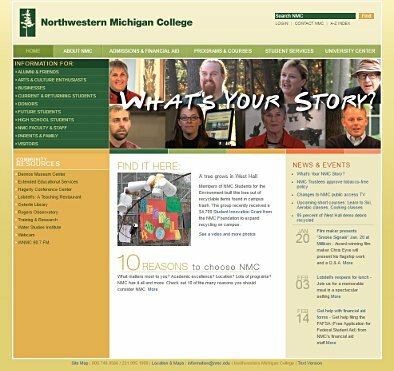 TRAVERSE CITY, MI — Northwestern Michigan College has launched a new, streamlined website, www.nmc.edu, with a goal of better serving students, community members and other constituents. More than a year in the making, the new website will enable NMC to offer more timely and accurate content, and provide multiple ways for users to quickly find information. Online registration for non-credit classes. E-commerce for the NMC Bookstore and Dennos Museum Store. Northwestern Michigan College is a publicly funded community college that serves more than 50,000 people, organizations and businesses annually. NMC offers associate degrees and professional certificates, and an extensive array of non-credit community classes. NMC also is home to the Dennos Museum Center, Hagerty Conference Center, WNMC public radio, and the University Center, whose partner universities grant baccalaureate, graduate and doctoral degrees. Flight Path Creative is a marketing communications firm based in Traverse City, MI. Flight Path was formed in 2004 by Aaron Swanker and Dan Smith, who combined have more than 20 years of experience serving companies of all sizes. For more information, visit www.flightpathcreative.com.